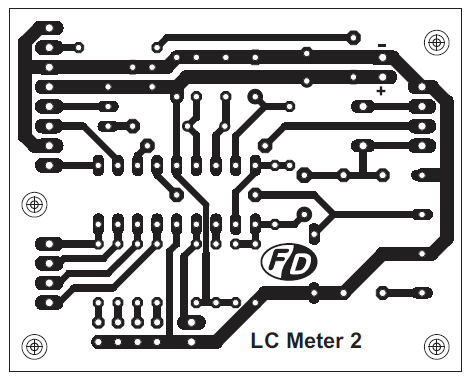 Here is another piece of laboratory equipment – LC meter. 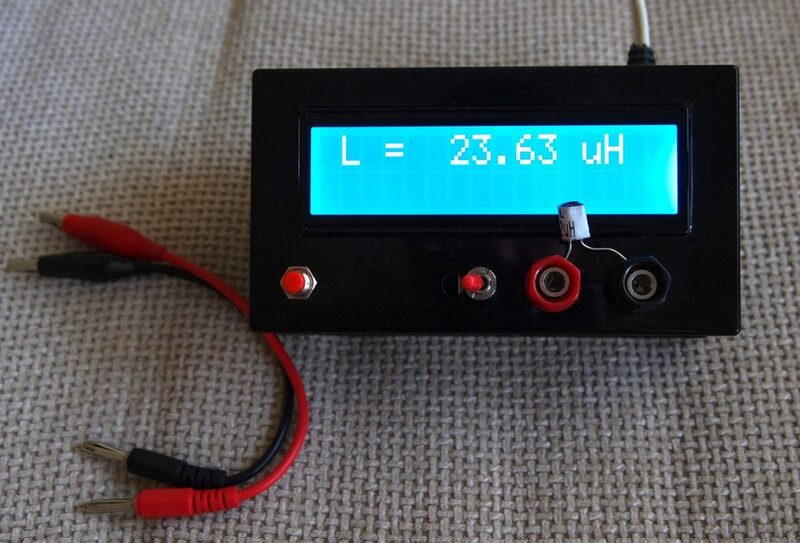 This type of meter, especially L meter is hard to find in cheap commercial multimeters. Schematic of this one came from this web page:https://sites.google.com/site/vk3bhr/home/index2-html. 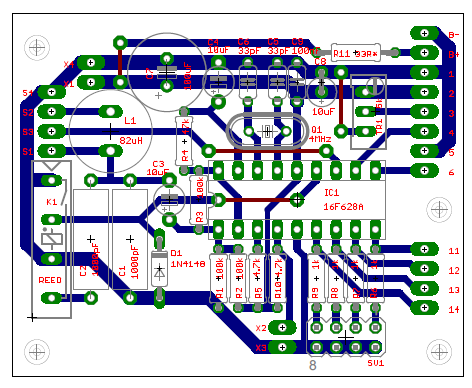 It uses PIC microcontroller 16F628A, and because I recently acquired a PIC programmer, I decided to test it with this project. 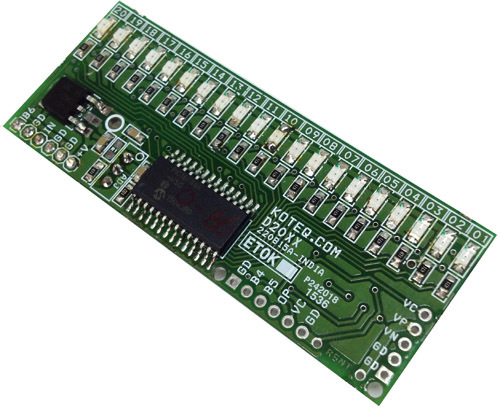 Following the above link you will find the original schematic, PCB, source and HEX files for programing the microcontroller and detailed description. I removed the 7805 regulator, because I decided to use a 5V adapter from Sony mobile phone. 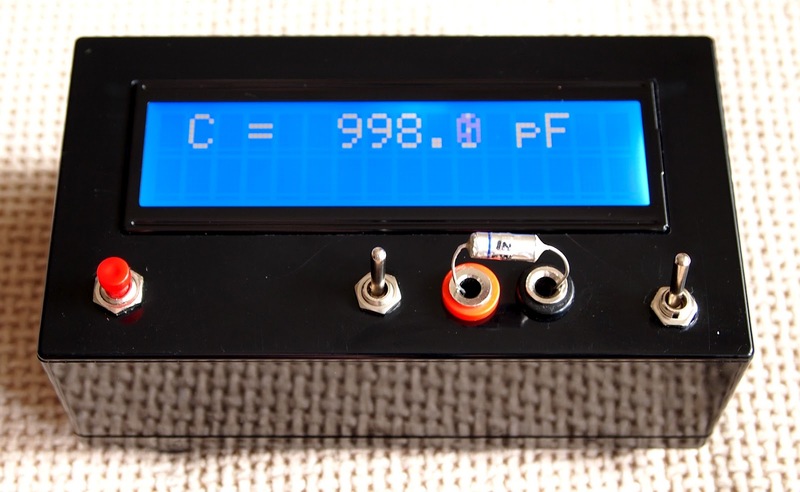 In the schematic, trimmer-potentiometer is 5k, but actually I put 10k, after consulting with the datasheet of the LCD module I bought. All three 10uF capacitors are tantalum and C7 – 100uF actually is 1000uF. Two 1000pF capacitors are styroflex 1% and inductor is 82uH. 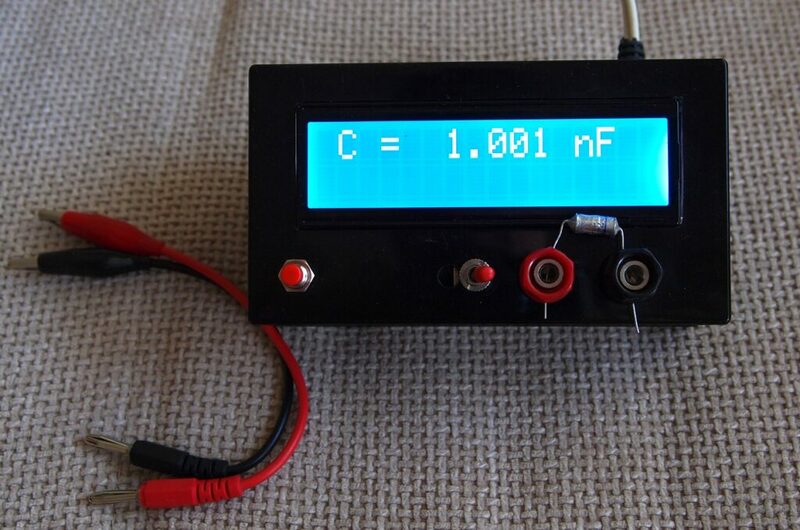 Total consumption (with back light) of the device is 30mA. 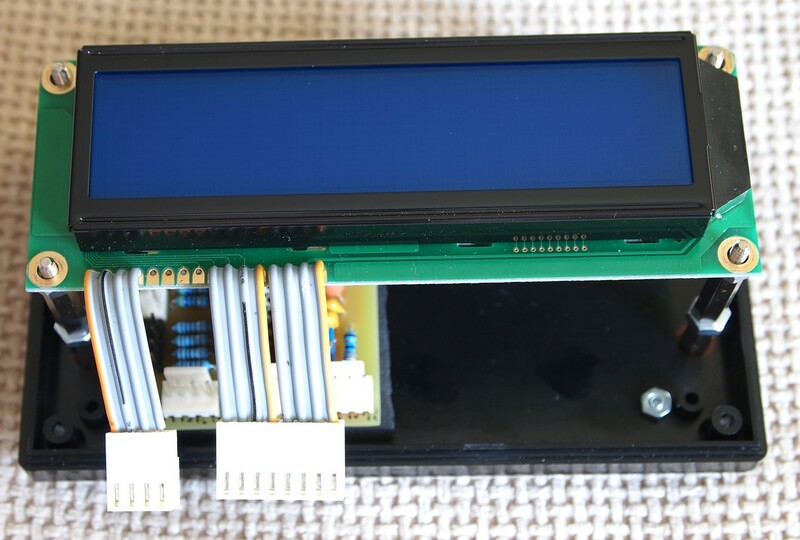 R11 limits the back light current and must be calculated according to the actual LCD module used. 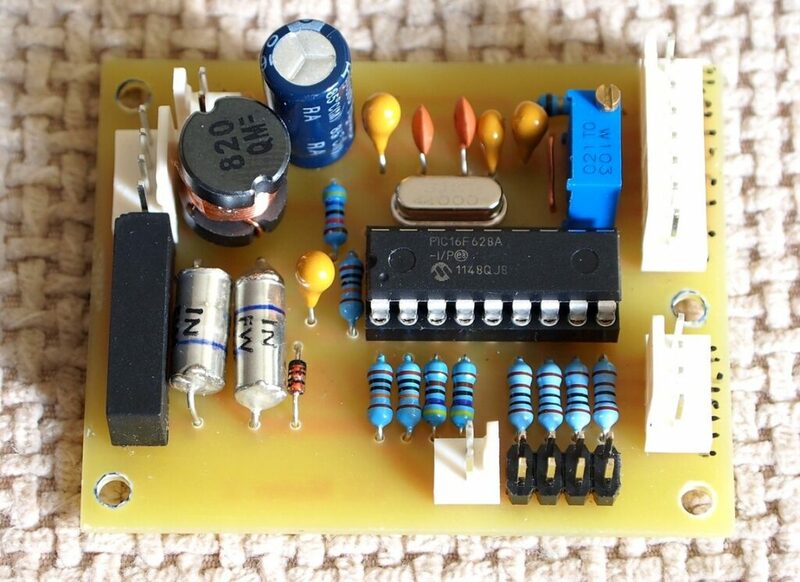 I used the original PCB as a starting point and modified it to suit better to my components. 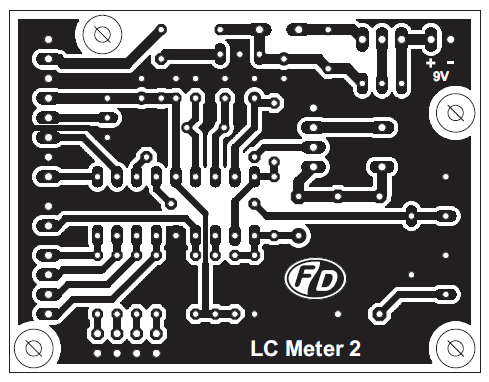 The last two pictures shows LC meter in action. 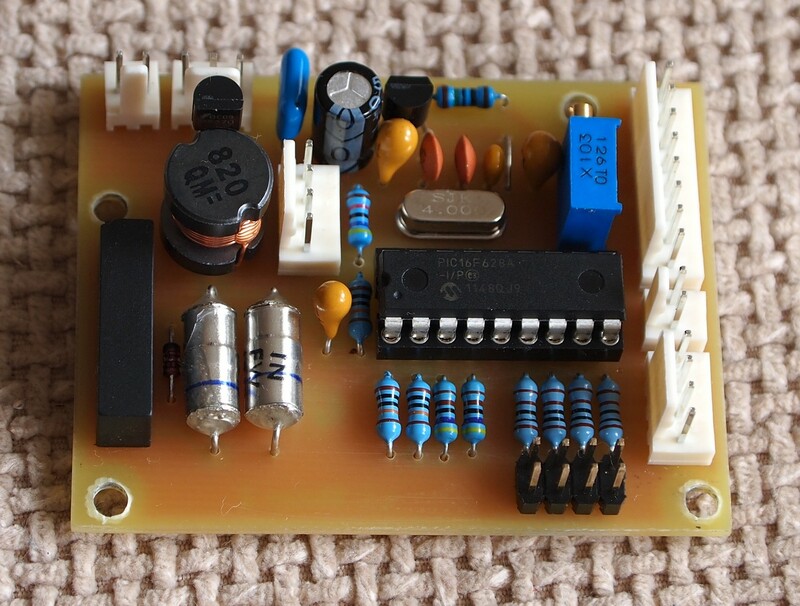 In the first of them, there is 1nF/1% capacitor and in the second – 22uH/10% inductor. 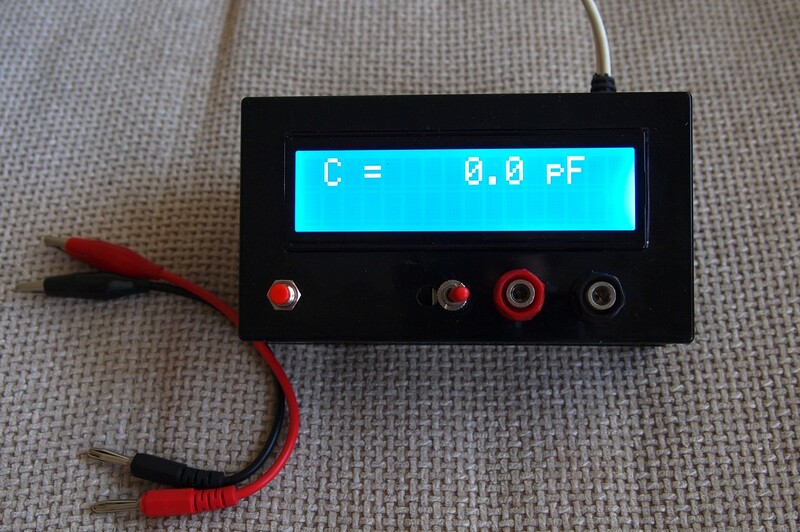 The device is very sensitive – when I put the test leads there is 3-5 pF reading on display, but it is eliminated with the calibrating button. 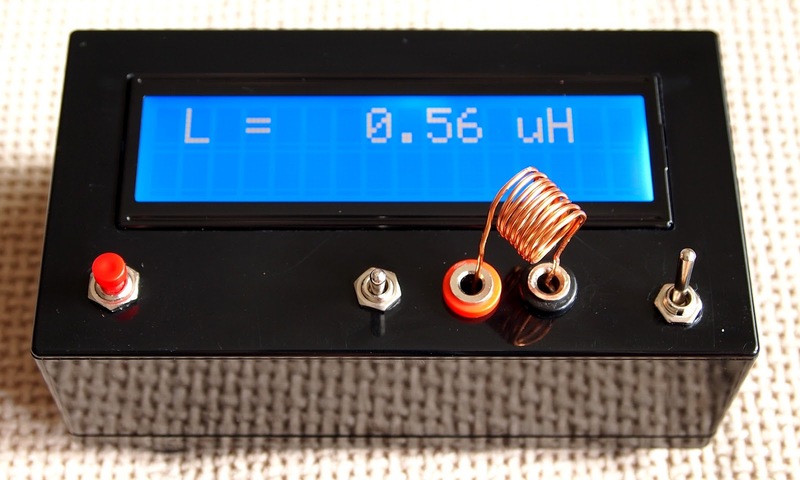 One of my colleagues in a Bulgarian audio forum ask me to build him a copy of the LC meter, but this time with 9V battery power supply. 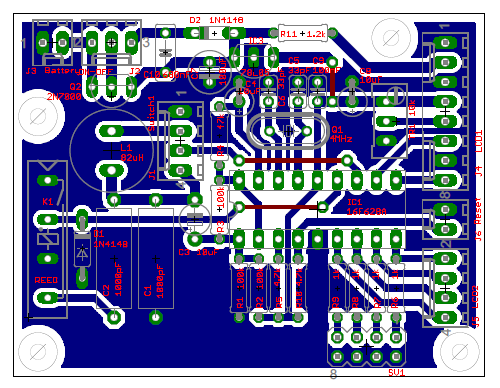 I made a new PCB with little rearrangement of the old one and adding a 78L05 voltage regulator. The goal here was to make power consumption as low as possible. With increasing the value of R11 to 1.2kOhm which control the back light current, total current of the device was decreased to 11-12mA. Without back light at all the power consumption will be decreased even further, but the visibility suffers greatly. After some tests, the value of the C10, which defines the ON time, was chosen to be 680nF. The ON time in this case is 10-11 min. 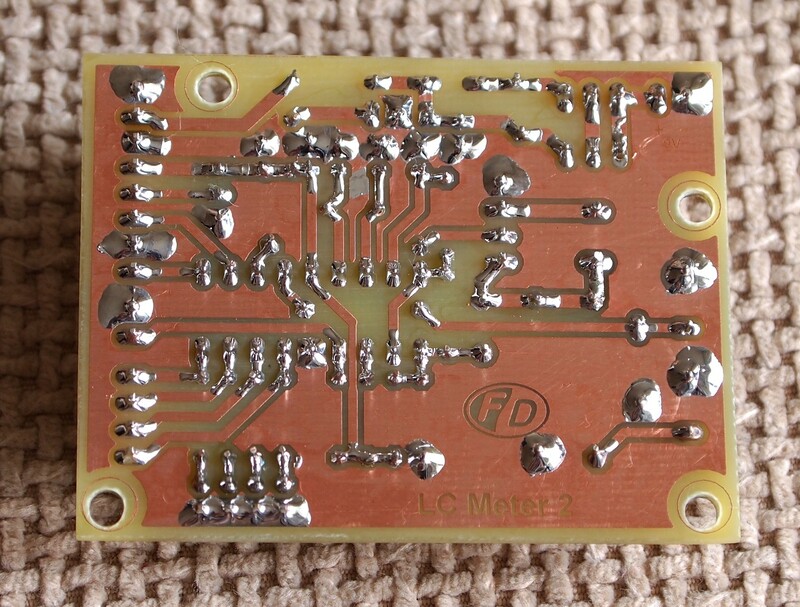 The MOSFET Q2 may be replaced with BS170, but bear in mind that the leads are in reverse order. ON-OFF switch is momentary non lock type. 6 pole multiple way switch for digital data, how to? Where is the code or hex file for PIC 16F628A ??? Sorry, Proteus file isn’t available. Hex code is added on the downloads section above. Muchas gracias amigo. Espero que funcione. Te volveré a escribir si consigo terminarlo. Soy nuevo en esto de la electrónica. Un saludo. Thank you very much, my friend. Hope it works. I’ll write again if I can finish it. I am new in electronics. A greeting. It seems correct behavior to me. But it’s better to contact the author about it. 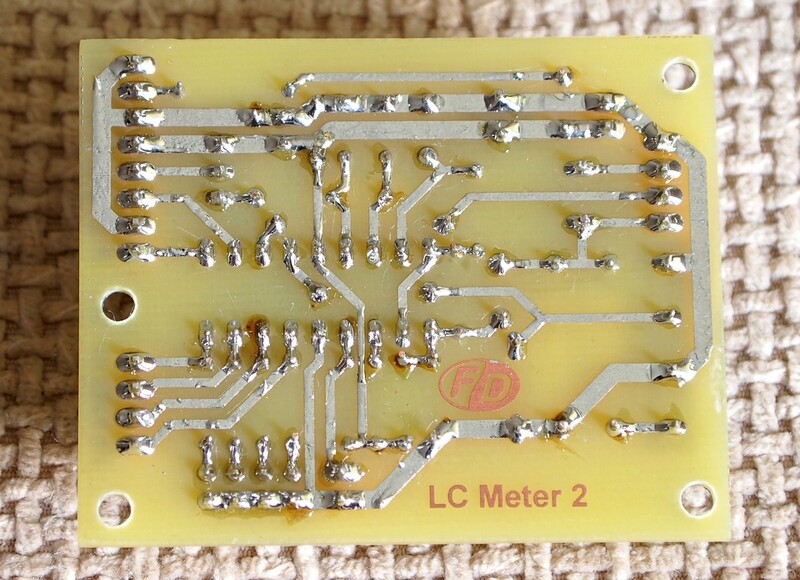 is the hex file works same on other L c meter circuit ?? The reed you use is replay? How many pin does it have? In Schematic I see It has 2 pins. 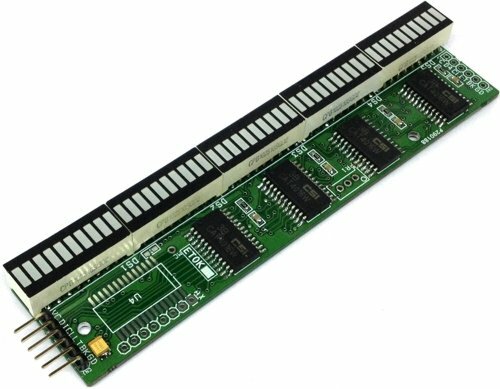 But, anyway I has 4 pins in PCB, what’s wrong? The reed relay K1 controls switch K1, so actually it has 4 pins. I need the code (maybe wirted .txt not .hex) Where I can find it? No, reed relay is a relay that uses magnetic field to control it’s state. 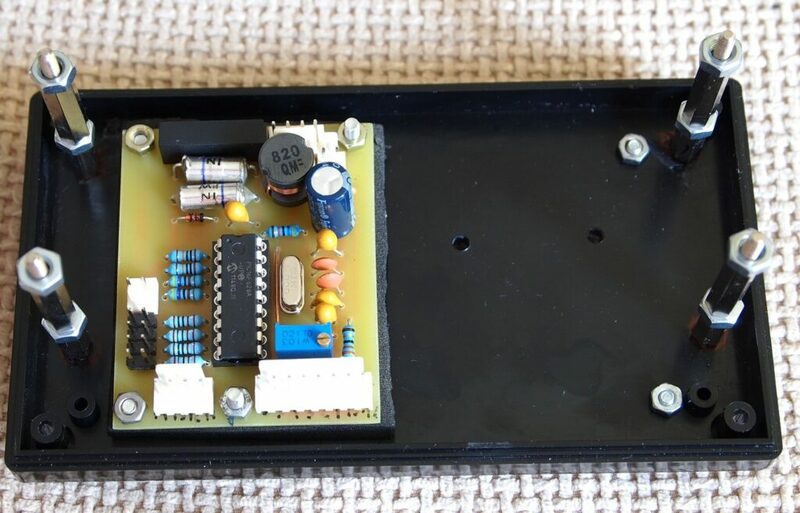 I had success using a reed relay 5V, SIP 1A05 (Pan-Chang) from eBay. You just have to connect the coil contacts and the Normal Open contacts. No other connections are needed.